I am a big fan of Oliver + S. The munchkin has about 5 pairs of Puppet Show shorts, and several bucket hats. And then the Sunny Day Shorts were released as a free pattern! I made up the size 4 for my nearly 3 year old nappy (diaper) wearer. They’re a bit big, but it’s winter here, so the plan is that she’ll wear them next season (although today it is 26ºC/79F here). Of course I added front slant pockets, as it increases the likelihood of wear significantly, borrowed from my previous trusty plain shorts pattern from Happy Homemade Vol. 2 (re-released as Sew Chic Kids). Along with the cute back pocket from the same pattern. Fabric is Cloud9 grey arrow cotton chintz collection from Spotlight (Australia) which retails at AUD$9.99 per metre. I picked up a 40cm remnant piece for $0.80. Disturbingly, I was out of 3/4″ elastic, so the purchase of the elastic was the most expensive part of these shorts. Fit seems great and am glad that I have a pattern that will stretch to 12 years of age and that I don’t have to add seam allowances to or trace. 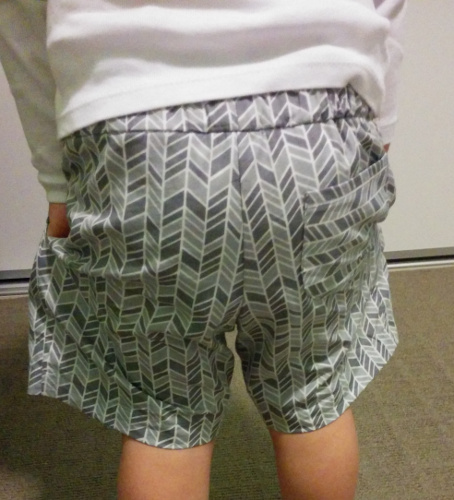 This entry was posted in Sewing for the munchkin and tagged Oliver + S, sewing for the munchkin, Sunny Day shorts on June 2, 2014 by B stitching.